Over 45 years ago Wallace McDowall was established as a sheet metal fabricator and has grown into one of the UK’s leading sub-contract engineering companies. The company is committed to the continual development of its highly-skilled workforce and investing in new technology. Wallace McDowall values modern apprenticeships and recruits new apprentices every year. At one point last year, they had 17 apprentices in different roles in the workshop and the office – all but one of them recruited through Ayrshire College. The company recruits apprentices from students who have been on the Performing Engineering Operations course and uses work experience placements as part of recruitment process. Logan Collins, Operations Director at Wallace McDowall, talks about how he works with the College to get the right apprentices for their needs. Our apprenticeship program is integral to the growth of our business and we are committed to developing our future workforce with the help of Ayrshire College. We believe that by bringing young people in as apprentices, who serve their time here and know the way we work, they will stay with us. We have former apprentices working successfully at all levels of our company including senior management. This year, we’re looking to take on four fabrication apprentices and two machine shop apprentices. We’ve worked with the College for a while and have a good working relationship with them. We go up to meet them and they come down here to meet us, and we’ve attended various events together. I just pick up the phone to Lynn, the Engineering Curriculum Administrator, tell her what I’m looking for and she’ll put an advert up in the College. Just last month, she shortlisted ten potential fabrication apprentices and ten potential machine shop apprentices for us. We then shorten it down to around six and arrange to get them in for a work trial. We’ll have them in over three or four weeks before we make a decision. We let students know at the start that this week-long work trial is effectively an interview and that they’ve got a week to impress me. If we get someone we think is brilliant, we will offer them a job straight away. We’ve done that in the past. There’s investment in it as well, we’ve got to invest in taking on an apprentice. They’re not going to be contributing too much for the first six or seven months but we’re fortunate that we’ve chosen good groups of apprentices. I’m seeing an improvement in the apprentices we have. We’ve got one guy who has finished his apprenticeship in that he’s submitted his portfolio, everything’s been passed and he’s got his certificate. Although he’s in the process of finishing his HNC, we’ve already promoted him to a shift leader based on what he’s done with us! I think the College prepares students for work a lot better than in the past and they listen well to our feedback. We had a problem a few years ago where we were getting potential welders who didn’t have experience of the type of welding that they were coming in here to do. That’s no longer an issue as students are getting shown what’s expected and that makes a big difference. 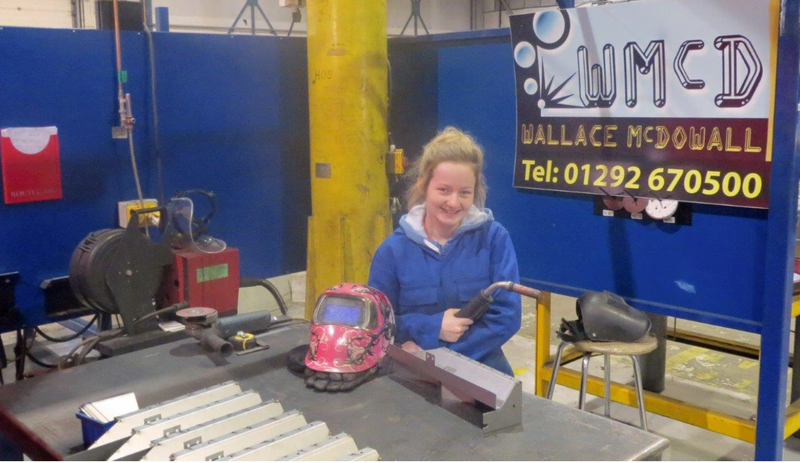 So, what does it feel like to be an apprentice at Wallace McDowall? Twenty year old Carra Woods is an apprentice fabricator and welder and tells us about her experience. When the apprenticeship vacancy came up, I applied for it through the College because I did my SVQ Level 2 there. I’m in the first year of my apprenticeship and come to college every Tuesday for my day release. During the four days in the workshop, it’s constant work – we’re building everything! We don’t get to do all the jobs because we’re still learning. But we get a shot at most jobs! I don’t really learn well from sitting down with a book. I’m more of a practical person and an apprenticeship just felt right. It’s good to have a mixture of the college and the workplace, balancing theory with practical skills. Having to communicate and work with others is very important in the workshop. You’ve got to work with your workmates when you’re doing a job, you can’t just decide you want to do things your way, it’s a team effort. I would definitely recommend an apprenticeship – it’s great to work, earn and learn at the same time.